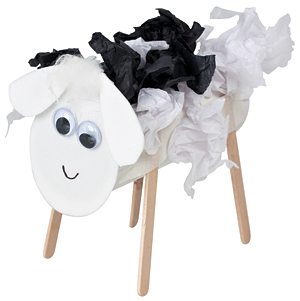 For the sheep's legs, glue four small Popsticks onto a Papier Mache Tube. 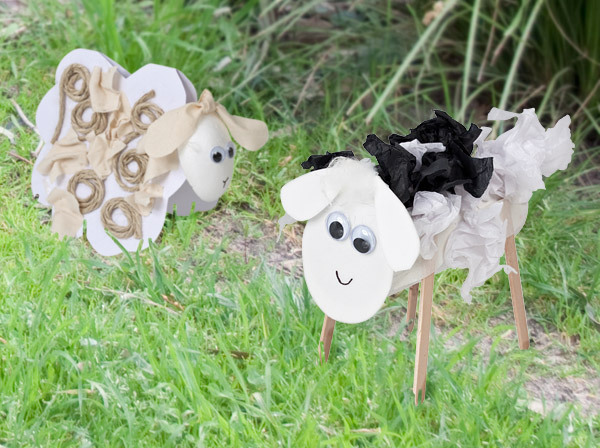 Cut a head shape and two ears from a piece of card or stiffened felt and glue these onto one end of the Cardboard Tube. Add Joggle Eyes and draw on a mouth. Cover the tube with scrunched up white Tissue Paper. Fold a Cardboard Square in half. Cut the body shape leaving attached at the fold. Scrunch up strips of Calico and wind Jute lengths into spirals. Glue to the body. 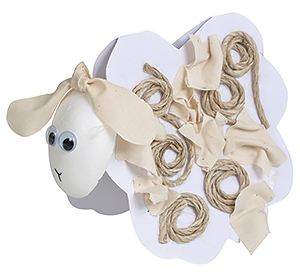 Glue the Poly Egg to the body of the sheep. Add Joggle Eyes, Calico ears and draw on a nose.